Compro Motocicletas Antiguos Alemanes Pre Primera Guerra Compro Motocicletas Antiguos Alemanes Pre Primera Guerra como los,…….. - Adler - Brennabor - DÃ¼rkopp - GÃ¶ricke - NSU Wanderer Y tambiÃ©n el 1915 de Austria motorcicleta PUCH, tambien documentos, libros, catalogos, articluos de publicaid y repuestos de estos y otros maquinas pre guerra,........ Meantime, ............... Read daily Up Dates on Art and Antiques for Buenos Aires, Argentina http://www.frassinetti.biz Argentina also exports antiques over 100 years old with the help of Bob Frassinetti Read all about the South of South America, Argentina, Chile and Uruguay on this link. www.frassinetti.biz Updated and new web site, The Buenos Aires Toy Museum, Argentina www.the-ba-toymuseum.com Chat some more soon, ................................ Bob Frassinetti. Compro Motocicletas Antiguos Alemanes Pre Primera Guerra como los,…….. - Adler - Brennabor - DÃ¼rkopp - GÃ¶ricke - NSU Wanderer Y tambiÃ©n el 1915 de Austria motorcicleta PUCH, tambien documentos, libros, catalogos, articluos de publicaid y repuestos de estos y otros maquinas pre guerra,........ Compro Motocicletas Antiguos Alemanes Pre Primera Guerra como los,…….. - Adler - Brennabor - DÃ¼rkopp - GÃ¶ricke - NSU Wanderer Y tambiÃ©n el 1915 de Austria motorcicleta PUCH, tambien documentos, libros, catalogos, articluos de publicaid y repuestos de estos y otros maquinas pre guerra,........ Meantime, ............... Read daily Up Dates on Art and Antiques for Buenos Aires, Argentina http://www.frassinetti.biz Argentina also exports antiques over 100 years old with the help of Bob Frassinetti Read all about the South of South America, Argentina, Chile and Uruguay on this link. Updated and new web site, The Buenos Aires Toy Museum, Argentina www.the-ba-toymuseum.com Chat some more soon, ................................ Bob Frassinetti. 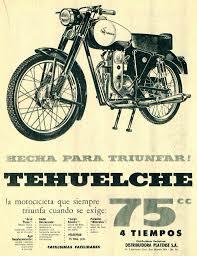 Travel Argentina by Motorcycle: The Motorcycle Diaries, a movie from 2004. All throughout the twentieth century traveling has been the world's most beloved leisure activity. Whether at an unspoiled beach side paradise or embracing other cultures this activity has touch us all in a variety of ways. Many of us have defined life plans under the influence of this indescribable feeling of freedom often experienced in these kind of adventures. Some have found true love. Others just grew in all sorts of ways. The recent Motorcycle diaries film is one expression of these deep trips' impact. The journey these young students did throughout South America is amazing. Riding a 1939 Norton 500 in not very good conditions they traveled through Argentina and Chile, where the Mighty one -how these boys had christened the bike- was now powerless. Many young Che admirers have ridden through those roads trying to relive their hero's experience. However they must be aware that the fact of traveling through the same passages does not turn them into the Cuban-Argentinean hero. On the road, as Jack Kerouac majestically expressed on his homonym book, frees your spirit and mind, lets you become yourself in the most deep possible ways (its not literal, its just what I felt when reading this masterpiece as well as traveling). The image of those intrepid young travelers is been going around my head lately. Though I'd love travel through the patagonian lands on a bike, in my mind the Norton 500 is in a much better condition than the one in the movie. May be because I'm an artdealer, and I would never let a vintage beautiful bike to be in such conditions, may be also because I love traveling the best possible way I can. Those gorgeous vintage bikes -much alike the outstanding antique cars that yearly travel through these southern Argentinean lands- belong in a majestic landscape such as this Patagonia. With the feel of wind blowing in my face, I find myself daydreaming of riding this vintage bike through the routes that once were rode by Guevara and Granado, and many more anonymous adventurers who have loved and treasured this unspoiled paradise. The trip shall begin in the beautiful Buenos Aires, were a few relax days will prepare me -and all those bike lovers that wish to come along in this fantastic journey- for an unforgettable experience. Then we'll hit the road. From BA throughout the immense Pampa we'll head south to Bariloche and the gorgeous San Mart?n de los Andes. At this point of the journey we'll walk on the wild side as we take Route 40 -my favorite route in the whole country for it runs from south to north side by side the imponent Andes mountains- that will lead us to paradise in Earth.